Between some good Church Sales, thrift store shopping and a few garage sales I was pleased with September's Thrifted Finds. Love the garden fresh carrots, they smell and taste so good, displayed in a vintage Pyrex Holidays casserole, Tupperware Autumn tumblers, Sadler cream and sugar, a fall colour lidded box, a green glass serving plate, 2 old sealers and a wrinkled Monday embroidered tea towel plus a small pumpkin from Hilltop Gardens Farm and here too. Love finding white. The Hunt Club large white teapot and a TG Green white basket weave pitcher were nice surprises. 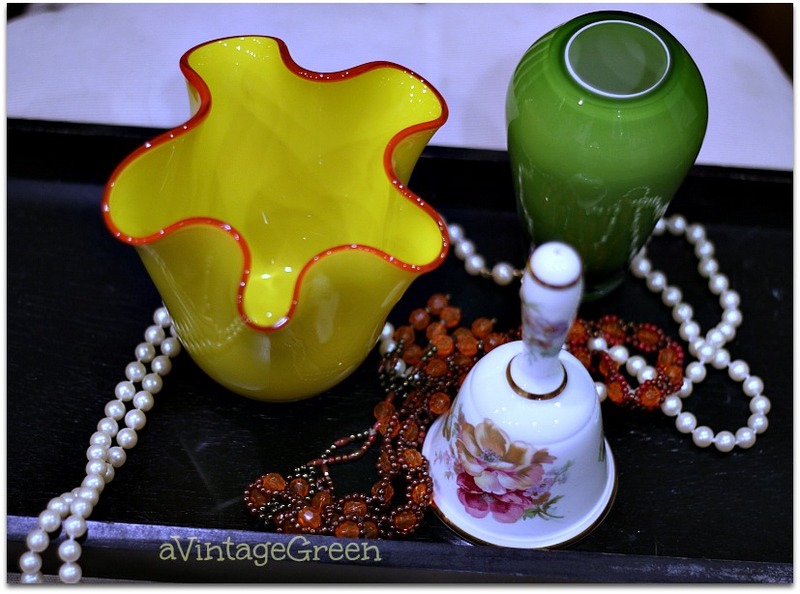 Bright coloured glass, a few vintage costume jewelry necklaces and a rose decorated bell grouped on a black tray. On our way back from Alberta we stopped in Salmon Arm and found a hand full of graniteware, well worn. 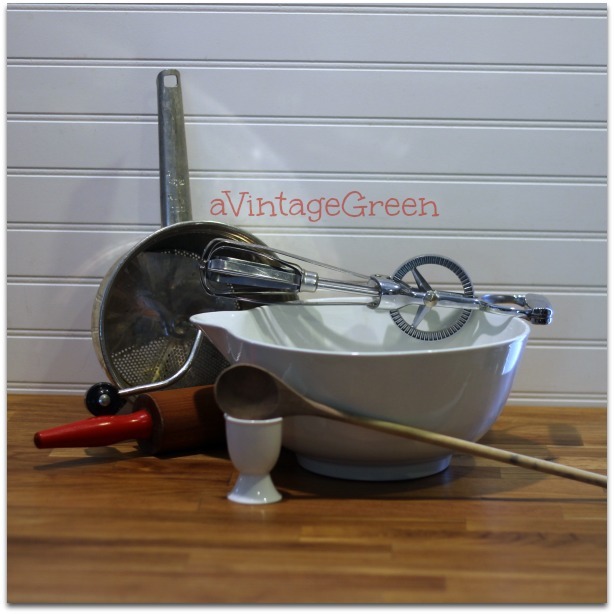 Another stop at a big thrift store added some more kitchenware finds, the batter bowl is a Grindley. The teapot is a Sky McGhie which surprised me because it is very plain. The Church sales always have something special and the brass Sanctuary bell was my favourite find so far. The mid-century decanter and delicate glasses were found at a garage sale. One of the set of six little glasses was broken before we arrived. 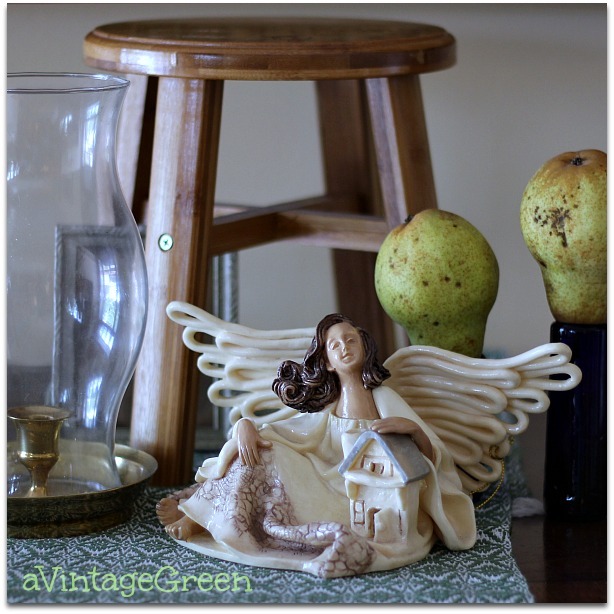 The angel below is a Wings of Tranquility "Bless this home" and the pears are from the tree in the back yard - the tree that had 3 big branches break off - see that picture at the end of an earlier post. I love this sealer with the wire handle and well aged blue lid. 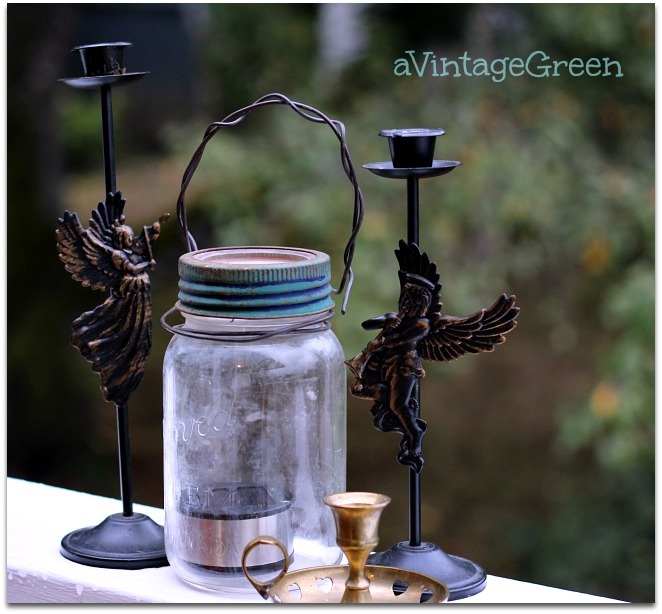 The angel candle holders colour mixed so well with the jar. While trimming the almost finished rose bushes today, removing rose hips, dead bits, leaves with spots, by accident snipped one of the last 3 blossoms. I will admit that having that rose in the house was very cheering, shown here with my cup of tea, things on the kitchen counter, normal stuff. Moved it to an open window to keep fresh overnight. I am loving the cooler days and the changing colours (Coastal BC). So many great things. 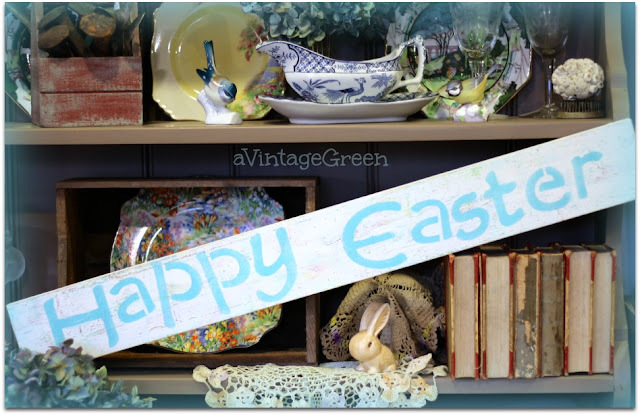 I love the blue egg cup and the Pyrex bowl!! Joy, what a lot of fun finds. It would be hard for me to choose a favorite! Lovely finds! I am very taken with the blue graniteware. It is perfectly worn and rusty! Wow! Wow! Wee! You did good! Love the ironstone. The teapot is beautiful and unusual. Love it! 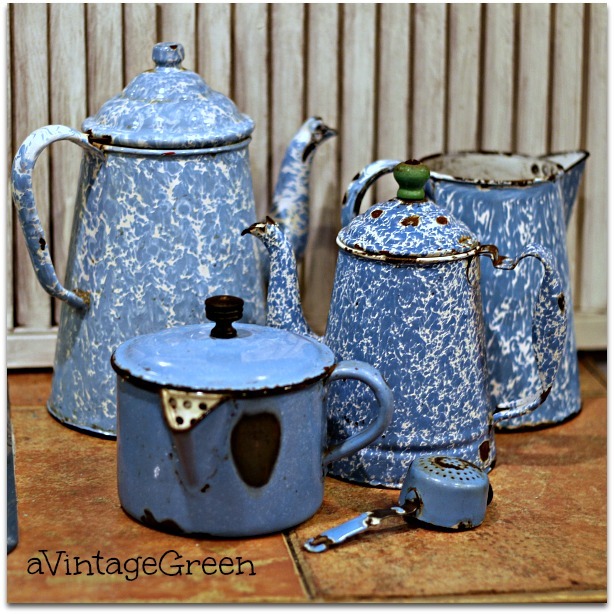 Love the blue graniteware ... would fit right in with my collection. Really nice things for your shop and the Sanctuary bell is very interesting. Great finds, although I think the teapot is my favorite! Wow you have so many great finds. I love the sanctuary bell. I wonder what the story behind that piece is? I have always wished I had an eye for finding the jems and not the junk. You definatly do. Thanks for sharing. Would love to see where you use these items. 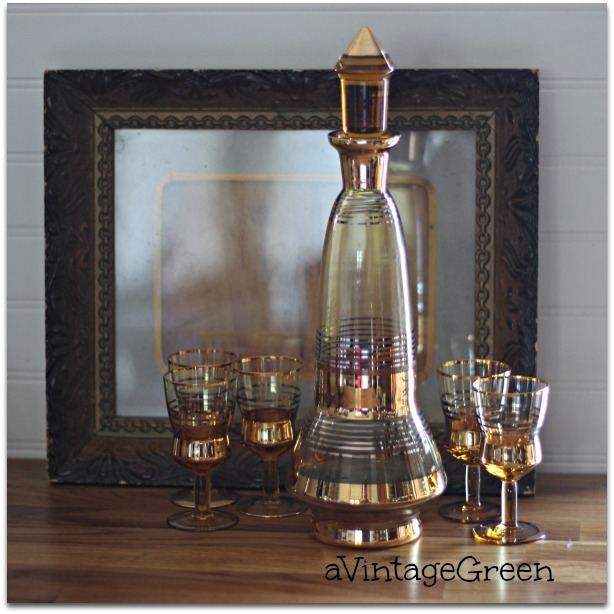 The old decanter and the glasses are very beautiful. Have a great week. 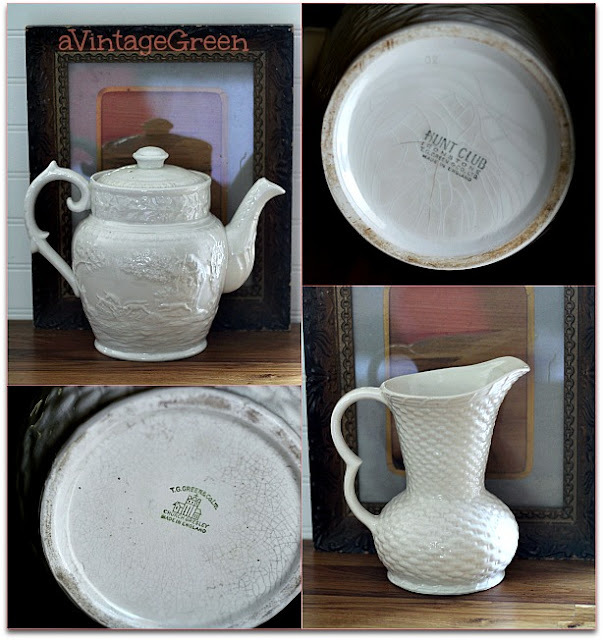 Loved seeing the treasures you collected last month, if I could walk into A Vintage Green right now I'd be leaving with the T G Green jug, the graniteware and the wooden stool. Seriously. Hello, wonderful finds and collections. I like the graniteware. 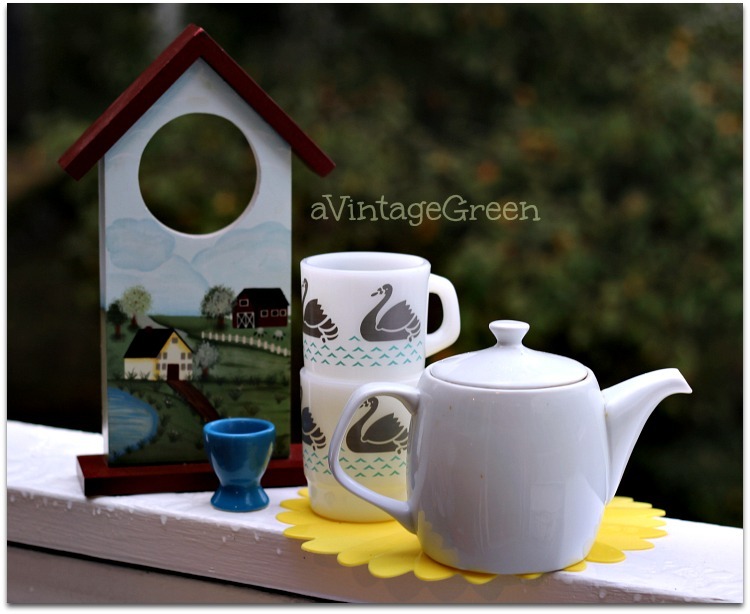 The birdhouse is cute too. Happy Monday, enjoy the new week ahead! Lots of great finds here. 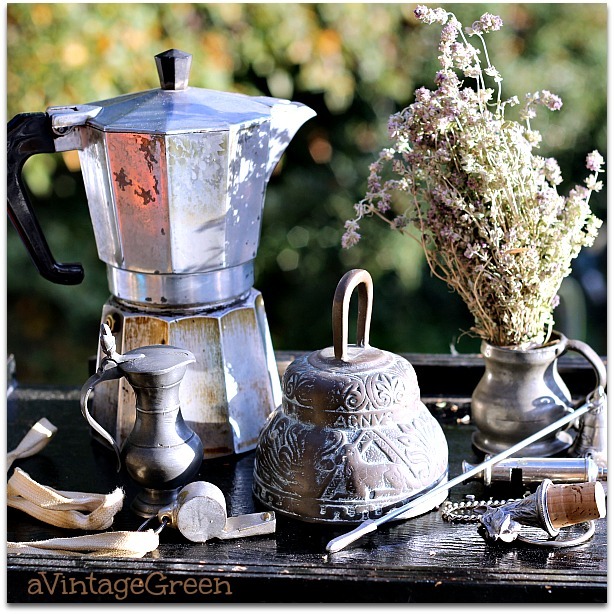 The graniteware is wonderful - a great collection of it. How pretty your rose is. Yes, autumn has arrived on the coast of BC! I love those angel candle holders. And then I go back to your banner...LOVE those old books! They are my favorite treasure! Hugs! 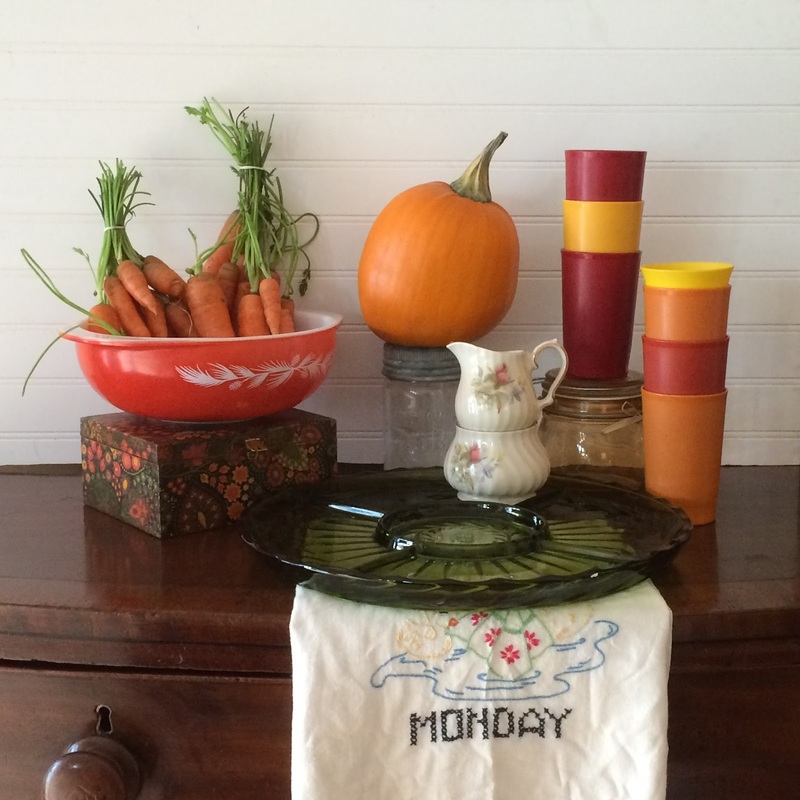 So many fun finds - the Monday towel and the blue enamel pieces won my heart. Joy, I love the rose and the rest is just eye candy. I love to visit and see your finds. Thanks for sharing. Sylvia D.
What a lot of great finds, and so well displayed! 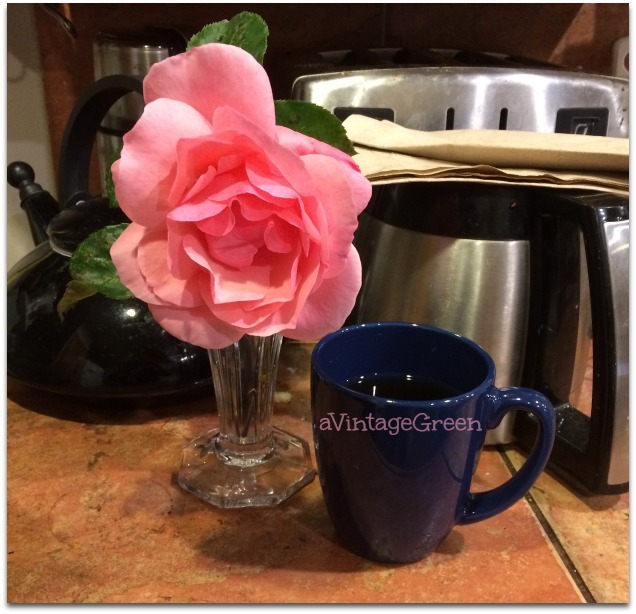 Love the granite, the swan mugs and that gorgeous rose. Great finds Joy. My favorite has to be the graniteware! I have a Pyrex casserole with that same wheat design. I love it! Thanks for sharing with SYC. How absolutely lucky you are to find so many excellent treasures. Do you keep it all or sell things you find? Since we live few miles out from town and stores I don't get to shop for wonderful finds as often as I'd like but easier on wallet. I do swoon and wish I could find such goodies like yours but then where would I put them all since we live in small house.